Have you ever been on a technology fast? Maybe you got tired of facebook and decided to take a couple weeks off? Or maybe you felt instagram was taking too much of your time so you erased the app off of your phone? I know I’ve been there, that’s why I wrote the book Detached. It is a 21 day retreat from your phone that allows you to go deeper into your faith while not having to sacrifice the good things your phone provides your life. As I was writing the book, I got to thinking; What was the new media of Biblical times? What did Moses, Elijah, Peter, Paul, Mary and even Jesus have at their fingertips (or toes) that was said to have make their lives “better?” What were the “new technologies” of their time and, did these things benefit their mission or steer their souls toward darkness? The “he” in this passage was none other than the 16 year-old King Uzziah who brought the heat to the Philistine armies. With rapid-fire arrow and stone shooting technology, you can bet who won that war (spoiler alert, Uzziah won for several years until his pride overcame his piety. It was then that he suffered the consequences of his own own folly: he was punished by God and became leper). There is no invention that has benefited, or harmed, the human race more than that of language. It is a two edged sword that is uncontrollable for most, but has the potential to build bridges amongst nations and produce peace. St. James tells us that “With it we bless the Lord and Father, and with it we curse human beings who are made in the likeness of God” (James 3:9), perhaps we should bridle its use and share in the silent speech of God through more contemplation? During an assassination attempt on St. Paul’s life, the commanding officials prepared their armies to guide him to Caesarea where he could be safe. To ensure a smooth passage, the Roman government had constructed a high-tech road system that made transporting their armies swifter and more efficient. 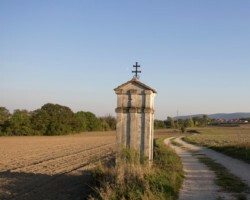 These roads helped them conquer more territory for the pagan armies, but they helped St. Paul and the first missionaries of the Church to spread the Gospel just as swiftly and efficiently. Tektons were wood and stone fashioners. They could make beautiful pieces of furniture, sculptures, and even houses. St. Joseph, Jesus’ earthly father, held this title and it is likely that Jesus picked up a few of his skills as a carpenter. The Arc of the Covenant was the most prized possession of the Old Testament. It was the manifestation of God on Earth and it even had a cloud that covered it constantly reminding the Jews who carried it toward the Promised land that God was with them. It contained the tablets of the Ten Commandments, Aaron’s staff, and pieces of the manna that fell from heaven. It was the highest form of storage technology to have ever existed prior to the New Testament. Ok, this one is just over-the-top magical. God’s ability to manifest himself in inanimate objects is amazing. Here he provides a gateway to healing for those who have faith in him, how much more can we share in such healings if we too have faith in something as powerful as the Eucharist? What we do know is that wineskins were used on multiple occasions as a means to drink the fine wine of Jesus’ time. Today, we see the upgraded version in the chalice which holds the greatest substance on earth, the blood of Christ. As shown with the cat o’ nine tails, the forms of weaponry and capital punishment were of advanced (and grotesque) quality. The method most loathsome, however, would eventually become the greatest symbol of hope the world has ever know. It consisted of “upright posts would presumably be fixed permanently in that place, and the crossbeam, with the condemned person perhaps already nailed to it, would then be attached to the post.” (link to source). It was the cross, which Our Lord hung upon to save us from our sins. Even the people of biblical times had to battle with the advantages and disadvantages of new technologies of their times. Our current battle with screens and devices are wreaking havoc on our souls and we all know it. Yes, there are some huge benefits to how efficient our devices can make life, but if we are honest with ourselves, there are many pitfalls that cause us to dwell less on the things of God, and more on the things of facebook, twitter, instagram, amazon and ebay. That’s why I wrote my latest book Detached. It is the quintessential do-it-yourself screen retreat book. In 21 days, I’ll show you how to break free from the screen use that wastes your time toward the kind that can enliven your spiritual life. T.J. Burdick the author of several books and articles on the Catholic faith. He writes and speaks on how to grow in holiness amongst the distractions and difficulties of the current age. He resides in Grand Rapids, MI, with his wife and four children. When he is not spending time with his family or writing books, you can find him teaching courses on the Catholic faith through the Dominican Institute (dominicaninstitute.com), an online learning platform that serves students of every age and ability.